Chicago Picasso, dedicated on August 15, 1967 in Daley Plaza in the Chicago Loop, is 50 feet (15.2 m) tall and weighs 162 tons. It was the first such major public artwork in Downtown Chicago, and has become a well known landmark. This work draws on many of Picasso's artistic experiments over the years, with its dislocation and distortion of form, the basketwork stucture connecting the minimalist facial contours with the huge steel wing-like strctures for the hair. The sculpture was commissioned by the architects of the Richard J. Daley Center in 1963. Picasso completed a maquette, or model, of the sculpture in 1965, and approved a final model of the sculpture in 1966. The final model, in welded steel and standing 20 m (60 ft) hight. The cost of constructing the sculpture was $351,959.17, paid mostly by three charitable foundations: the Woods Charitable Fund, the Chauncey and Marion Deering McCormick Foundation, and the Field Foundation of Illinois. Picasso himself was offered payment of $100,000 but refused it, stating that he wanted to make a gift of his work. Undoubtedly the most famous of Chicago's many outdoor sculptures, the Picasso was unveiled in the Civic Center Plaza on August 15, 1967. Greeted at first with catcalls, scorn and ridicule, the sculpture marked the beginning of Chicago's love affair with contemporary art, a l ove affair that would lead, a few years later, to the passing of an ordinance requiring the city to set aside a percentage of its annual construction and renovation budget for art purchases. The past 40 years have seen Chicago become a tourist's dream - outdoor sculptures dot the city by the dozens. Despite the poor reception the sculpture initially received, the statue has become one of Chicago's unofficial symbols, along with the John Hancock Center, Soldier Field, and The Art Institute lions. Few are the citizens of Chicago now who do not recognize and point with pride to this colossal work. 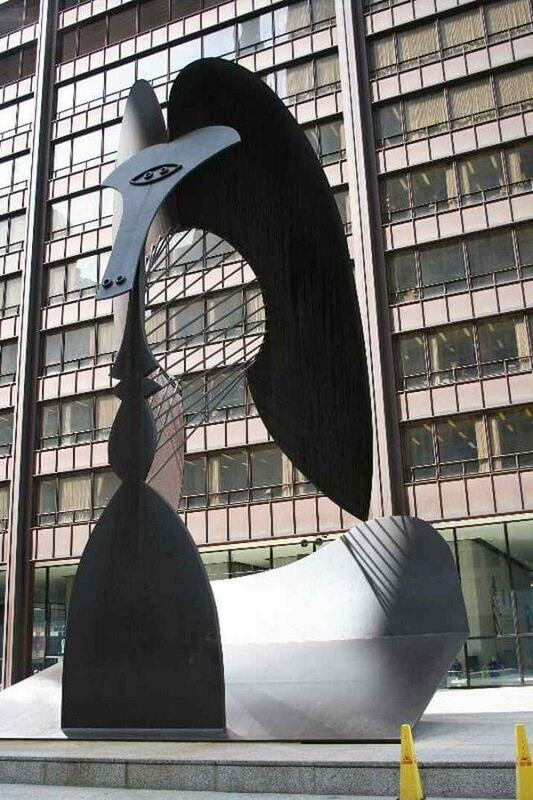 Today The Chicago Picasso has become a well known meeting spot for Chicagoans. Depending on the season and time of the month there are musical per formances, farmer's markets, and other Chicago affairs are held around the Picasso statue in front of Daley Plaza.